Some things to note: the Flashing Light turns on during the second half of the cycle (i.e. it starts off for 500 ms and then turns on for 500 ms). If you want the Flashing Light coil to be on initially, change the Timer 1 contact in the third rung from normally open (N.O.) to normally closed (N.C.). Timer 2’s output contact only stays on for one program scan. That means it acts like a one-shot or a pulse. Program scan times can vary widely in PLCs. Older PLCs with slow processors and long ladder logic programs can have scan times in the hundreds of milliseconds. Newer PLCs have typical scan times in the tens of milliseconds, and PC-based PLCs like Beckhoff’s TwinCAT might have scan times in the sub-millisecond range. This is important because it affects the repeatability and accuracy of your timers. If your PLC has a 250 ms scan time then the period of the Flashing Light coil in the above example will vary anywhere from 1000 ms to 1500 ms. That’s because each timer is going to vary from 500 to 750 ms. If the program scan time is 10 ms, then the Flashing Light coil’s period will range from 1000 ms to 1020 ms (which is much more reasonable). If you need your timers to be more accurate than this, then you’ll have to dig into the documentation of your PLC. You may be able to create a “high speed task” that runs more often than the main program. 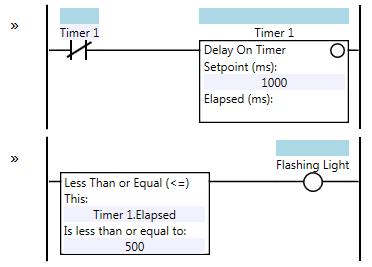 Typically this higher speed task would be driven by a timer interrupt which preempts the main logic. 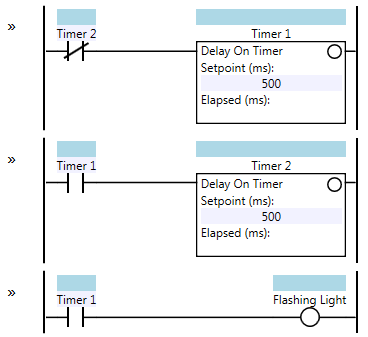 This one-timer variant reduces the inaccuracy of the timer from two scan times to one. For instance, if your PLC has a scan time of 250 ms, the one-timer variant’s Flashing Light coil will have a period ranging from 1000 ms to 1250 ms. That’s significantly better than the two-timer variant. Also note that the self-resetting timer pattern (Timer 1 resets itself and then immediately starts timing again) is actually creating a one-scan pulse every one second. This is a pattern in itself that you may see used for other purposes. feeling kinda silly that I couldn’t figure out the first approach on my own. I had all kindsa rungs that would almost get me what I wanted. This instantaneous change cannot be adapted in electro-mechanical equipment, causing both timers to repeatedly switch on/off. There is a bogus effect of self latching. The circuit will continuously reset causing all of its switches to go gratata tatata tatata. Such circuitry must be held using a specific types of timers containing an external DC battery to operate during the on/off states of T2: instead of an immediate state of N.C to N.O thr circuit based on 24H timer will relax, takes enough time to change state. Either this or other sort of solid state technology must be invovled within. The timers are internal to the PLC. There will be no issues with the circuit. It is not noted but the T1 NO contact is a T1.DN bit as well as the T2 NC contact. T1 begins timing. Once T1 is done timing the output bit turns on and causes T2 to begin timing. Once T2 is done timing, the T2 output turns on. This turns T1 off and resets it. Because T1 is now off, T2 turns off and resets. Because T2 is off, T1 can now begin timing. The cycle now starts over. Using the T1 NO contact, it will flash the light since the T1 output is on every 500ms for 500ms.